It looks like something out of a fantasy comic book, but the photo above is actually a luxury hotel in Singapore called the Marina Bay Hotel. That boat shaped thingy located at the top of the structure is actually the Sands SkyPark. 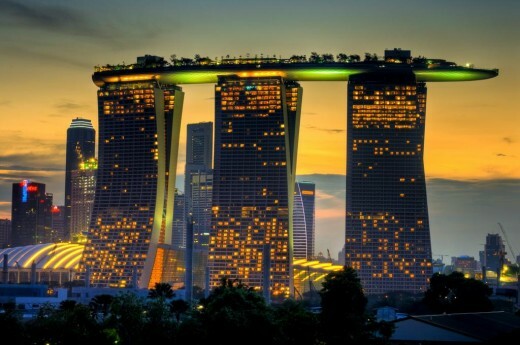 This unique structural masterpiece, designed by visionary architect Moshe Safdie, floats atop the three soaring Marina Bay Sands hotel towers 200 meters in the sky. 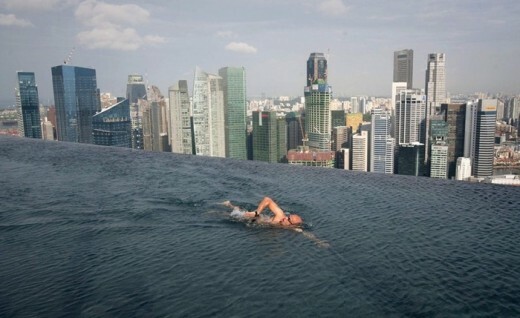 At the top of the 55 story building is a 150-meter infinity swimming pool.